There is also a poll out yesterday from Rasmussen which puts the number of undecided at 5%. I’m not sure, but I don’t think it really matters. The underlying message of the polls tell us is that there are enough undecided and ‘iffy’ voters that how they decide to vote will determine who our next president will be. On the one side, there are those who voted for Obama, in part because they felt a change was needed from Pres. Bush, and Obama seemed to capture many of the voters who were “in the middle.” Now, there is disappointment by many of these folks with Obama, with the continued state of the economy, and with questions whether Obama can really lead the country out of the mess we’re in. Not all of these folks, I think, are ready to give up on Obama, in part because he is likeable and in part because there is some recognition that he was handed a terrible situation which was then compounded by a Republican decision and campaign not to cooperate with him to solve our nation’s problems. 1) he is being heavily influenced by the very people who refused to tackle our financial problems over the past three and a half years, some of whom want to dismantle the major programs that have benefited large numbers of our society, and some of whom are far to the right of Romney. 2) he is supported by the very wealthy businessmen and corporate interests who have benefited from the policies of the last decade while large numbers of middle class folks (and a large number of the undecided?) have suffered, raising the question “who does Romney truly represent? 3) he is a very, very wealthy man who may not truly understand the problems of most Americans (refusing to publish his tax returns for 10 years plays into this) and adds to the question of whose interests does he/can he truly represent. 4) he has not made a case for how he would go about reversing and solving our problems, as people understand simply cutting more taxes and cutting programs has not worked, despite the Republican mantra that that is the answer. So it seems to me, the election is still to be won or lost. 1. Economic Report Card on Pres. Obama’s First Term, The Economist, Sept. 1. This report seems to me to be devoid of rhetoric and the fairest analysis I’ve seen. Be sure you see the ‘report card’ at the end of the article even if you don’t read the entire column. 2. The Deficit. While I don’t agree with many folks who seem to believe that the budget deficit is our major problem (I think the trade deficit is more of a long term problem), take a look at this one chart in this WaPo article if you truly want to understand what is driving our national debt. 3. The Bailout. Many folks, I believe are confused and/or do not understand this issue. There is a website that just focuses on the data. It is easy to understand, and you can learn for yourself how the bailout money has been spent (including in your own state). As always, I encourage MillersTime readers to comment, respectfully, on any or all of this post. If you are looking for some good reading that will probably keep you up later than you’d planned, here are three recent reads, all of which I’d give four stars (out of five). 1. The Passage of Power: The Years of Lyndon Johnson, Robert Caro’s latest tome on LBJ. If presidential politics, leadership, power and how Washington really works is an interest of yours, invest the time in this one. 2. A Real Emotional Girl: Memoirs of Love and Loss, Tanya Chernov. The more I reflect on this first book by a 30 year old, the more amazing I think it is and the more I am convinced that it is deserving of your time. Hallucinations by Oliver Sacks. I’m a great fan. There is an excerpt of this book in the Aug. 27th New Yorker. The book will be released Nov. 6, 2012. 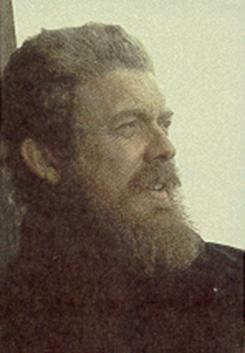 Sutton, by J.R. Moehringer, author of the wonderful memoir The Tender Bar (MillersTime review). Moehringer also collaborated with Andre Agassi to write Open. 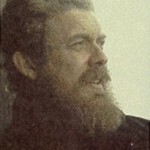 Sutton is due to be released Sept. 25, 2012. Finally, although I kiddingly referred to this above, I am planning again to ask for your Best Reads of the year. I will do so in early December and so hope you will respond with the names of the books you have most enjoyed this year. 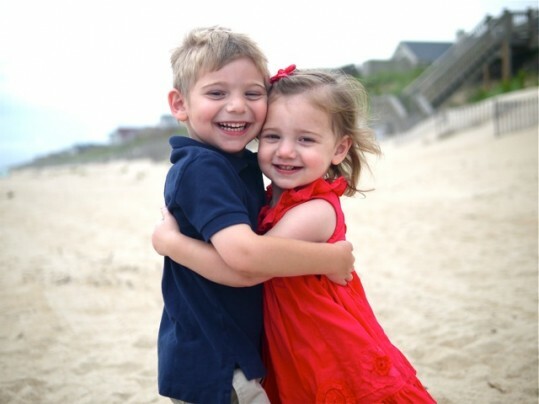 For those of you who enjoy keeping up with grandson Eli and granddaughter Abby, here are 12 of Nonna’s (Ellen Miller’s) latest from the Outer Banks. Within the last several weeks there have been two different articles in the media, interviews actually, one featuring daughter Elizabeth Miller and one highlighting her cousin Kate Shapira Latts (our niece). I’ve seen the two articles in the digital media, tho they may be in the print media too. Both interviews focus on the work of these two young professionals and, to a lesser degree, their personal lives. 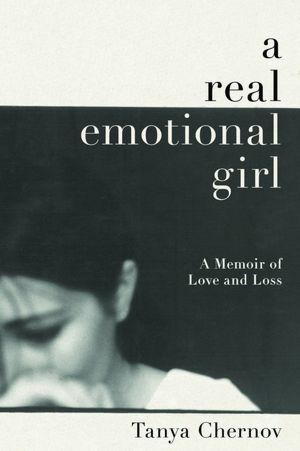 Monday night I started Tanya Chernov’s A Real Emotional Girl, A Memoir of Love and Loss. Tuesday I spent most of the day reading it through to the end. It is the very personal and very honest recounting of Tanya’s ten-year attempt to come to terms with the loss of her wonderful father Richard Chernov and her painful attempts to find a place in the world without him. Whether others will find this memoir as emotional wrenching, as insightful, and as wonderful as I did, I honestly don’t know. I hope so. I think it’s outstanding. Know that I know the characters in Tanya’s just published book. Richard Chernov, her father, is one of the most wonderful persons I have ever known. He is a former lawyer who became a summer camp director and created Birch Trail Camp for Girls, where my daughters and many, many young girls have spent some of the most memorable and important summers of their lives. Tanya will tell you why he was so wonderful. She sees him clearly, and the man she describes is the man I knew. Barbara Chernov, her mother, is Richard’s long time partner in everything he did. While she plays a smaller role in this memoir, the person Tanya describes is the person I also know. Dylan and Gabe are her two older brothers. I don’t know either of them very well, but from what I do know of them and from what Tanya writes, Richard and Barbara did a terrific job parenting them. Tanya herself is the youngest of the three Chernov children and the only girl. She is about 16 when Richard is first diagnosed with cancer and the book covers approximately the next 10+ years of her life (and that of her family too). Many of the current and not so current memoirs written by women about loss have been about the loss of their fathers, mothers, or husbands. I have not read much where a child, an adolescent, a young woman has written about this kind of loss. And for me, that is the wonderful thing about A Real Emotional Girl. Tanya has taken us (and I hope others who do not know the Chernovs or Birch Trail) on her painful and loving odyssey following the loss of her father and on the search for herself. If you read it, do let me, others know what you think. MillersTime reader JC emailed me today, asking what I thought the Nats’ should do concerning Steven Strasburg. 1. I would meet with just Steve and his family and lay out, in as detailed a fashion as possible, what the various medical folks say about what is known concerning the year following Tommy John surgery and what they recommend, including conflicting recommendations. 2. Then I would tell Steve and his family to take a week to consider what they want to do and come back and let me know their decision. 3. And I would honor that decision. Proceeding in this fashion is not to absolve Rizzo or the Nats’ of responsibility, but it is to give the Strasburgs the right to decide for themselves how to proceed. Nor is it because it is likely they would choose to continue the season into the playoffs. In fact, I would offer to keep this process confidential, and if the Strasburgs chose to shut it down now, or at any time before the end of 2012, I would offer to let their decision be presented as my choice, if they wished. Pitching Strasburg in October is not a betrayal. It’s simply recognizing that circumstances have changed…Not pitching him is a betrayal: to the pitcher, to the team, to the fans and to the city. If you haven’t read Tom Boswell’s piece on this issue, also in the Post, read it, and then let folks know what you think. PS – For those of you who are no doubt awaiting my great insights on the recent Sox trade (firesale? ), I’ll spare you. I suspect we haven’t seen the end of the Sox moves to repair their (our) broken team. Plus, there’s enough already written about what they did last weekend. Basically, no one really knows or will know for some time whether it was brilliant, stupid, etc. Father time will so determine. We’re Screwed, No Matter Who Wins? I’m generally not one to believe in conspiracies or fall for the first negative story about someone or something I don’t like anyway. But putting together a few stories from the last few weeks leads me to be quite worried about where we’re headed in this country. As you know, Romney will be chosen this week as the Republican presidential nominee. Whether or not Norquist is correct (that Romney will do as he is told), if the House and the Senate are in Republican hands and Romney wins, Congress will likely drive the agenda. Not Romney. 2. Another article which didn’t get much coverage, but which, if true, means the Executive Branch will be further indebted to a very few, very wealthy individuals, ones with a very specific agenda. 3) And according to Joel Kotkin’s article, The Screwed Election: Wall Street Can’t Lose, and America Can’t Win, it doesn’t even matter if Obama wins the election. Wall Street wins whether Romney or Obama is president. A very recent example of what Kotkin writes about, the power of business to affect policy, in this case, the Obama administration, can be seen in this NYTimes article: Ties to Obama Aided in Access for Big Utility. (Hat tip to RW for pointing out the article). If any of the above, never mind all three, are true, it’s kind of discouraging. “Black Watch” Is Coming Back. Don’t Miss It (Again). Sept. 19 – Oct. 7. At Washington, DC’s Shakespeare Theatre, Sidney Harman Hall. It will no doubt sell out quickly, as it did last time it was here. Check out my mini-review Jan. 30, 2011, or even better the NY Times & WaPo reviews, linked to below. As part of its international tour, The National Theatre of Scotland’s 2006 production of Black Watch is currently, but only briefly, playing at the Shakespeare Theatre’s Sidney Harman Hall. It is a drama about the famous Scottish regiment, its history, its deployment in the war in Iraq, and the effect of the war on the soldiers both in Iraq and once they returned home. The staging is a major part of the production, mixing music, dance, video, and much loud ‘bombardment’ of sounds of war. The language is initially a bit hard to understand, but as the play develops, the words seem less important than the visual representation of what is happening and has happened to the individuals and to the regiment as a result of its time in Iraq. To read NY Time’s Ben Brantley’s review of the production in NY in 2007, Click Here. To read the Post’s preview of the Shakespeare Theatre’s presentation, Click Here. Today the Post reviewed the current performance and ‘waxed eloquently.’ Click Here. In addition to its Washington performances, Black Watch will be performed in other cities in the US, including Chicago, Seattle, and San Francisco. Thanx to long time friend Harry S., I’ve got a new sports writer to add to my favorites (Boswell & Posnanski lead that list at the moment). Doug Glanville, a former baseball player (Cubs, Phillies, Rangers), is now writing occasional articles in the NY Times, (mostly) about baseball, the players, and how the game so often relates to real life. His articles are thought provoking and insightful, and he writes well. This one starts off about the Chinese diver who was not told of her grandparents’ death nor her mother’s cancer until after she performed in London. He moves on to baseball, but the article’s really about what he believes is most important in life: relationships. In Glanville’s most recent column, he wonders if baseball is immune from the slings and arrows thrown at it, largely from within. For more Glanville articles, go to Articles by Doug Glanville. Also, Glanville wrote The Game from Where I Stand: From Batting Practice to the Clubhouse to the Best Breakfast on the Road, an Inside View of a Ballplayer’s Life, published in 2010. I haven’t read it, but it’s now on my ‘to read’ list. Whether these differences come from nature or nurture, from a genetic source (some folks believe this), the ‘environment’ in which we live, the influences of class, wealth, education, etc., or are related to our life experiences, the one constant seems to be is that we all have our particular lenses through which we see the world. But that doesn’t answer the basic question. It just peels back the onion a layer. We still have to understand our lenses and from whence they come. In a recent article Benjamin Hale, a philosophy professor, writes about two doctrines of fairness, a universal view and a first person view: ‘The Veil of Ignorance’ and ‘The Veil of Opulence.’ For me, this article adds to my understanding of the lenses through which we look at the world. I am not interested in birds, fish, or salt marshes. Well actually, eating fish and other sea animals is of interest. And one of my daughters got me interested in dolphins a number of years ago. Plus I have enjoyed some occasional spying on colorful fish the few times I’ve gone snorkeling. But as species of general interest, I can go for long periods of time without thinking about what goes on in the underwater world of sea creatures. As for birds, the expression “that’s for the birds” amply fits my view about those winged creatures. I’ve never understood the fascination with ‘birding’ even tho some folks I like very much (and otherwise seem normal) are enthralled. And I’ve never thought about salt marshes at all. Which brings me to a book I’ve just finished that I want to recommend: A Place Between the Tides by Harry Thurston. It’s about all those things I mentioned above that didn’t interest me. Yet I was fascinated by Thurston memoirs and memories of what he has learned, experienced, and continues to observe where the land meets the sea in Nova Scotia. A naturalist, Thurston has written extensively and prize winningly about the Atlantic Coast, the Bay of Funday, the Nature of Shorebirds, etc. In addition to being a biologist and a wonderful observer of life around him, he’s a bit of a philosopher and a poet. He writes beautifully, and in spite of my prejudices about fish, birds, and salt marshes, his A Place Between the Tides was one of the most enjoyable (certainly one of the most informative) books I’ve read this summer. The memoir was written in 2004 and details a year of life, his and his environment, on the banks of the Tidnish River in Nova Scotia. It is organized by months as he weaves what he sees, what he remembers seeing from when he was young (he’s always lived near the sea), and what he knows about the birds, the fish, the salt marshes, animal behavior, and the interrelationships of all those things. It is also both a personal reflection on his life as well as an introduction to one part of Nova Scotia. Readers of this MillersTime/GoSox blog know that I hold Thomas Boswell in the highest esteem. For me, he’s one of the best sports writers working today. I always learn something from his columns and feel lucky that he writes in my morning newspaper. Read the column, Stephen Strasburg Shutdown Debate Masks the Washington Nationals’ True Story, if you’re a Nats’ fan or if you just want to learn a bit more about baseball and what Boswell thinks makes for good management. If you know the name Jonathon Kozol, then it is likely you were teaching at one point in your life, probably in an inner city. And it’s also likely that you read some of his writing (Death at an Early Age, Savage Inequalities, Amazing Grace, Rachel and Her Children, The Restoration of Apartheid Schooling in America, The Shame of the Nation, etc.) and were influenced to some degree by him. 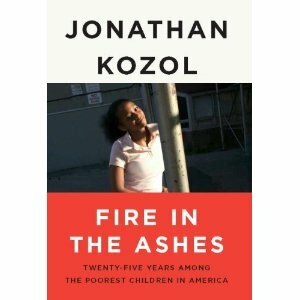 Well, Kozol has a new book, Fire in the Ashes, Twenty-Five Years Among the Poorest Children in the Nation, due to be published next week, August 20, 2012. If you want to join me to hear Kozol speak (and probably sign books), I’ve got several extra tickets for this Politics & Prose sponsored even. The evening is Tuesday, Sept. 4 at 7 PM at Sidwell Friends Meeting House in Washington, DC on Wisconsin Ave., NW. Email me (Samesty84@gmail.com) or call me (202-320-9501). Update – Wed., Aug. 15, 2:45 PM – My available tickets for Kozol’s appearance have been claimed. You can get tickets through Politics & Prose Bookstore for $12 or if you buy the book ($27), you get two free tickets. Update – Mon., Aug. 20 – For those of you smart enough not to live in the DC area, you can see/hear Kozol elsewhere as he’s on a book tour around the country. 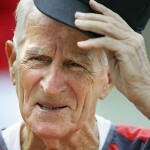 I have no doubt that Johnny Pesky is resting in peace. 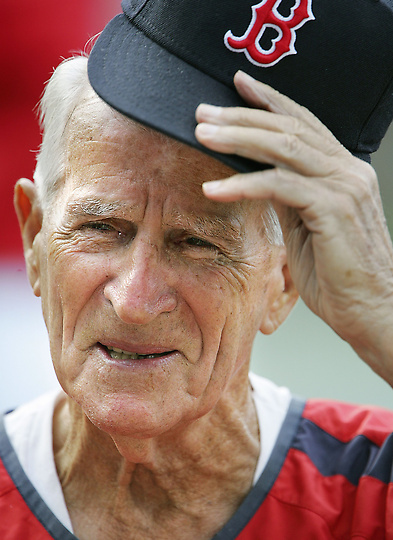 After all, virtually all of his adult life (he died at 92 yesterday) was spent doing what he loved – something connected to baseball, most of the time connected to the Red Sox. 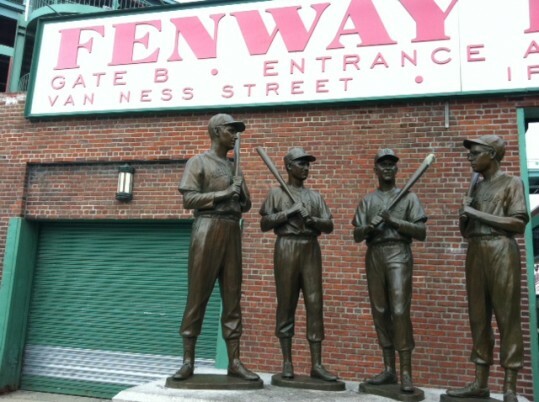 If you’re interested in baseball, you already know much about Pesky and no doubt have already read tributes to him, tho most of you know him because of the “Pesky Pole” and as a wonderfully kind, elderly mentor and cheerleader for several generations of Red Sox players. My own brush with this little guy (he was 5’9″) goes back to my earliest connections to baseball. 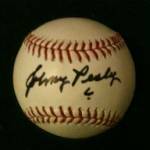 For me, Pesky was one of the first Red Sox players I knew and cared about, along with Ted Williams, Bobby Doerr, Dom DiMaggio, Mel Parnell, and Jimmy Piersall. I’ve written elsewhere on this site (I Blame You) about my wonderful grandfather’s ‘gift’ to me of the Red Sox. As I was learning about the game, getting to know the players, and going to Fenway one week a year, Pesky was a favorite of mine. 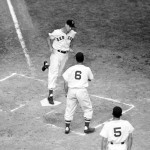 He could field brilliantly and was the part of terrific double plays along with Bobby Doerr. 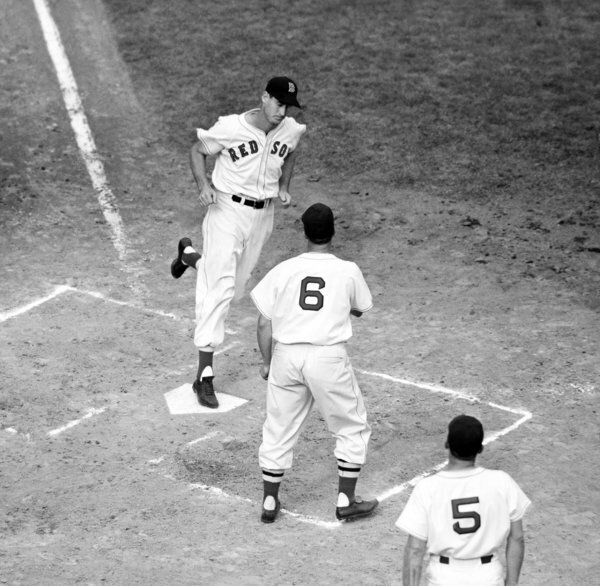 Even better, he could hit, at least get on base (his lifetime average was .307), and, most important, set the table from his number two spot in the line up for my biggest hero, Ted Williams. Then suddenly he was gone. For a reason I never could understand, the Sox traded him in 1952. I couldn’t believe it. But tho I didn’t know it at the time, that was a foreshadowing of the current era where very few players stay with a team their whole career. Eventually, I ‘forgave’ the Sox for this perfidy (something I was to do many more times in my life) but was delighted in my adult years when he came back to the Sox, became a fixture in the Red Sox Nation, and the Sox retired his number (6) even though he never made it to the Hall of Fame. PS-If you haven’t read David Halberstam’s The Teammates: A Portrait of a Friendship, you’ve got a treat in store.